Although we repair and install a variety of different heating and cooling systems in Barrie, ON, furnaces are one of our specialties. Carrier Furnaces. 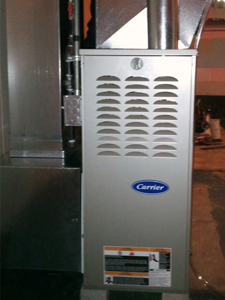 We carry and install Carrier furnaces because we believe they are one of the best home heating systems currently on the market. This brand of furnaces will heat your home completely on those cold, winter days and operates efficiently, so you don’t get stuck with outrageous heating bills. Additionally, we also take pride in carrying Carrier furnaces because there is a vast selection of models for you to pick from. If you aren’t sure exactly what model will be the right fit for your home, we can help you pick one that will complement your needs. Furnace Repair. A broken furnace is not only an inconvenience, but it’s also a safety hazard when the temperatures outside are below freezing. At Southern Comfort HVAC, we are not only dedicated to your comfort, but also to your safety. Because of this, you can reach our service department for furnace repair at any time of the day or night. Once you make this call, we will immediately send one of our certified technicians over to your home to take care of the problem. If you are worried about what our rates will be for emergency service, don’t be. We promise that our rates are always affordable and competitive, so you don’t have to go without a working furnace for very long. Furnace Installation. Having the right company install your new furnace is one of the best ways to prevent maintenance issues in the future. At Southern Comfort HVAC, we have the knowledge and skill required to proficiently and correctly install a new furnace in your home. Additionally, our furnace installation services come with either a 5 or 10 year warranty that covers both parts and labour. If you are considering installing your new furnace on your own, we advise against this for several reasons. First, furnaces are complex devices. Without experience, it may take you an unnecessary amount of time to figure out how to install it correctly. Secondly, new furnaces are designed to be efficient. If you do the install yourself, you may compromise the system’s ability to operate as efficiently as possible. And lastly, there are many safety hazards associated with installing a new furnace that you may not be aware of. At Southern Comfort HVAC, we will ensure that your furnace is installed quickly, efficiently, and affordably.